Easily mount up to a 37" tire on either side of your rig! One big reason people upgrade their rear bumper is to have a very stout place to mount an extra large spare tire while gaining undercarriage clearance. 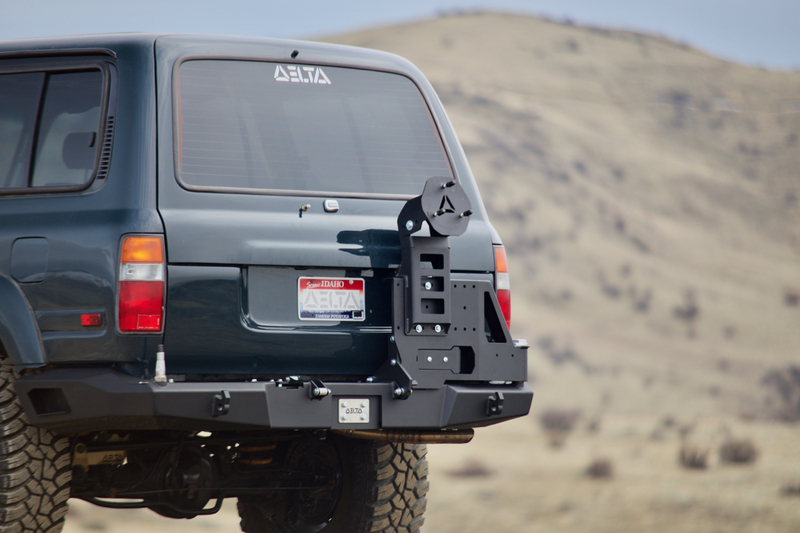 The DeltaVS spare tire mount can mount in almost any position along the back of the vehicle (as long as you have to swingarms), so you can dial in exactly where you want the tire located, ideally out of your line of sight! We are not aware of any other bumpers on the market that offer you this capability. One of the many reasons to choose a DeltaVS bumper. The Standard height model is designed to fit a 35" tire and you can squeeze a 37" tire on there without issue. The 1" Taller height model will allow mounting of up to a 39" tire.